Once an active volcano, the idyllic Polynesian archipelago of Bora Bora is made up of the remnants of the collapsed cone, and is one of the world’s number one destinations for romantic getaways. 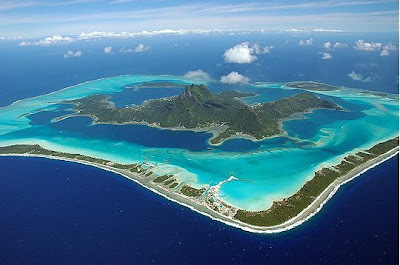 Located about 140 miles (230 km) northwest of the Tahitian capital, Papeete, Bora Bora was originally named Pora Pora, which means ‘first born’ in Tahitian, but documents from the 18/19th century list the island as Bolabolla and over time it seems the two names have become one. The lush green cliffs of Hawaii tower high above the Pacific Ocean just under 2,000 miles from the United States coastline. Hundreds of islands, scattered over 1,500 miles, make up the archipelago chain and many still demonstrate their volcanic origins, with live lava flows and steaming rocks. Hawaii is most popular with deathwish surfers seeking some of the best waves in the world. 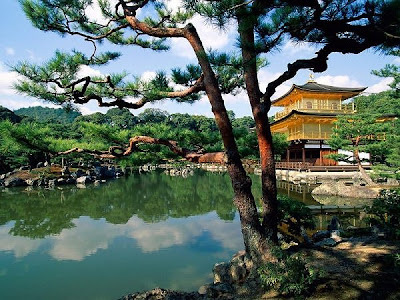 Consisting of over 3,000 islands, the entire country of Japan is an archipelago. It sits on the Pacific Ring of Fire at the juncture of three tectonic plates, making it a pretty lively country in terms of volcanic activity. Catastrophic earthquakes and tsunamis occur several times a century, with the most recent Chuetsu earthquake in 2004. 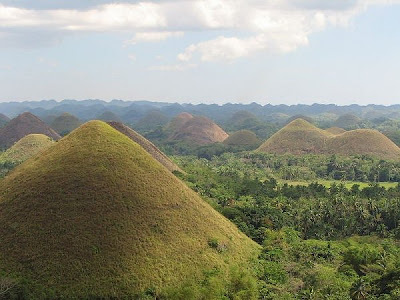 The Chocolate Hills of Bohol are a geological phenomenon and one of the Philippines top tourists attractions. Spread over an area of 20 square miles are 1,268 grass-covered, cone-shaped limestone mounds, the highest being about 120 meters in height, and so called as the grass turns a chocolate brown color during the dry season. Bohol is the 10th largest island of the Philippines archipelago, which comprises 7,107 islands in total. 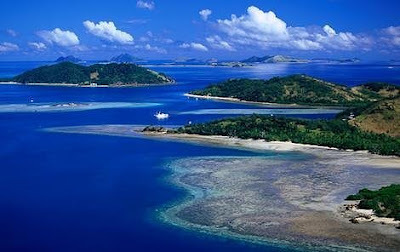 The South Pacific islands of Fiji are an ever-popular tourist destination as the climate is warm and tropical most of the year. 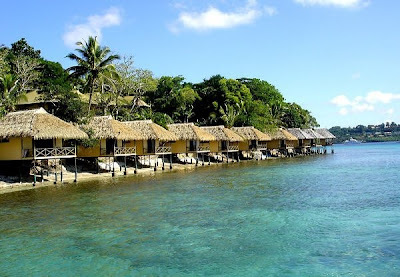 There are 322 islands in all but only 106 are inhabited, with the larger islands of Viti Levu and Vanua Levu being the most populated. The island of Vorovoro is currently home to sustainable development project Tribewanted, which is now in its third year and proving to be a huge success in ecotourism. Popular with scuba divers, the island archipelago of Vanuatu is relatively small in comparison to other archipelagos with just 82 islands. Ownership of the country has changed hands many times over the years but after an independence movement in the 1970s the archipelago became the Republic of Vanautu in 1980. Known to native Maoris as Aotearoa, or The Land of the Long White Cloud, New Zealand is made up of three main islands – the North Island, South Island and Stewart Island, as well as several smaller islands. Its myriad landforms make New Zealand is an exciting place, with tropical islands to the north, bubbling geysers in the sulphuric region of Rotorua, glaciers to the west of the south island and alps in the south. 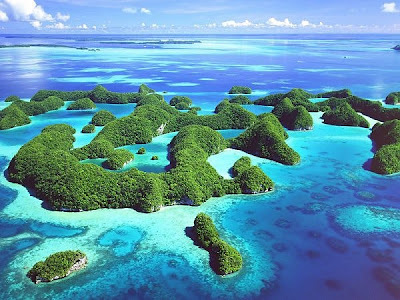 The island nation of Palau is located about 500 miles (800 km) east of the Philippines and is one the world’s youngest. 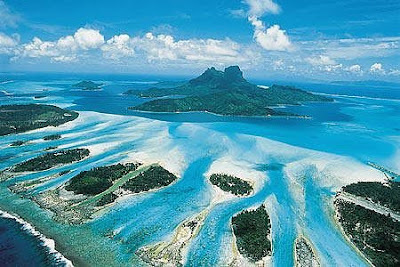 One of the beautiful islands was used in TV show Survivor, which spurred an interest in Palau as a holiday destination. 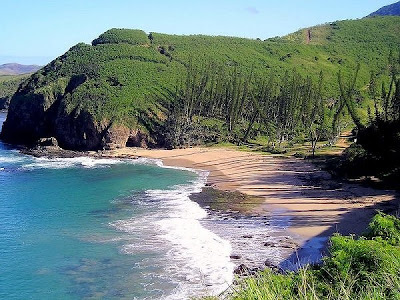 New Caledonia in the southwest Pacific region of Melanesia was named by intrepid explorer Captain Cook after Caledonia in Scotland, as it bore a remarkable resemble to the Highland country. Unlike many other archipelagos, New Caledonia is not volcanic but thought to be a fragment of the ancient continent Gondwanaland – the conglomeration of South America, Africa, India and Australia – and broke away from what is now Australia about 100 million years ago. 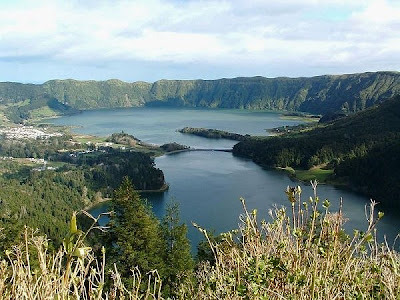 The Azores are a Portuguese archipelago sitting just 950 miles (1,500 km) from Lisbon on an active triple tectonic junction over the North American Plate, the Eurasian Plate and African Plate, making it a hotbed for volcanic activity. Made up of 700 islands and 200 coral cays – sandy islands formed over reefs – the Bahamas are the lowest lying archipelago with the highest point, Mount Alvernia, reaching a mere 63 meters high. The archipelago, although independent since 1973, has remained part of the Commonwealth of Nations, which is why the countries politics and law resemble those of the UK so closely. 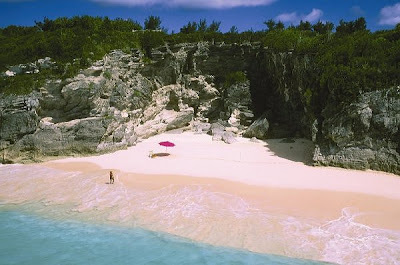 Probably best known for its bizarre triangle, Bermuda’s inviting waters and natural beauty manage to entice regular visitors despite the threat of disappearance. The archipelago sits in the North Atlantic Ocean, off the south east coast of the United States and is made up of approximately 138 islands. The volcanic Cape Verde islands sit just off the cost of Senegal and are a wonderful mix of Portuguese and West African cultures. 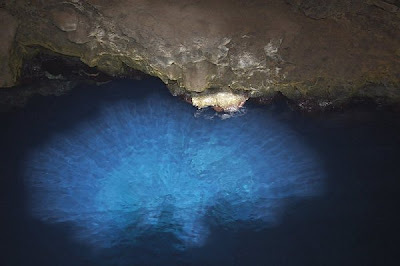 Uninhabited until the 15th century, Cape Verde is becoming more and more popular with visitors, especially those seeking perfect windsurfing conditions and divers wanting to explore the Blue Eye of Cape Verde (pictured), which is about 50 m deep. 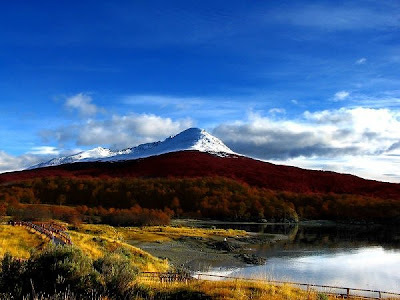 You’d be forgiven in thinking that the name Tierra del Fuego, which is Spanish for Land of Fire, has a warm and toasty climate when in fact it is quite inhospitable. Lying at the tip of Chile the islands are cold, wet and often covered in snow. Its name actually derives from the Ona and Yaghan tribal traditions of lighting bonfires. The tip of the archipelago forms Cape Horn, which is often considered as the southern-most tip of South America. 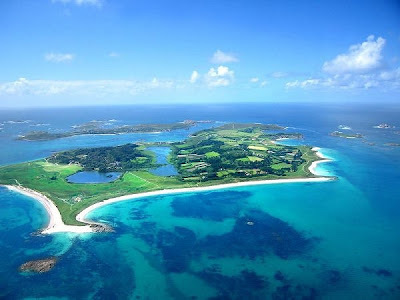 Part of the British Isles archipelago, the Isles of Scilly lie just 28 miles (45 km) off Land’s End, England and form their own archipelago of six populated islands and a number of smaller rocky islands. Scilly is a great example of sustainable culture; it has been inhabited since the Stone Age with the population living off the land and sea until the 20th century, and even though farming and fishing continues, as with many small communities these days, tourism has become the main industry. 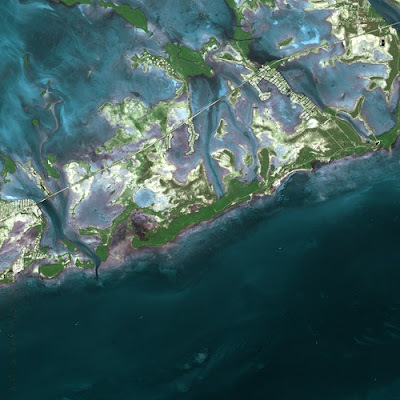 Not the view most people associate with Florida, this satellite image shows just how many islands make up the Florida Keys – 1,700 in total. The archipelago stretches from the southern tip of Florida to Key West and it’s fine sunny climate make it an all-year-round holiday destination. The Greater Antilles are part of the West Indies and include the countries of Cuba, Jamaica, Haiti, Dominican Republic and Puerto Rico. This wonderful HDR shot beautifully summarizes the colorful cultures of all the islands. 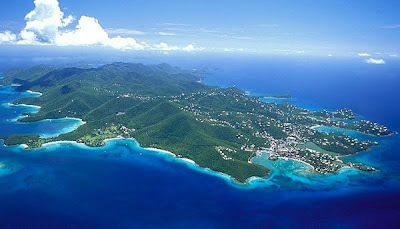 The Virgin Islands archipelago is part of the Lesser Antilles and is divided into the US Virgin Islands and British Virgin Islands. The islands were originally inhabited by Ciboney, Carib and Arawak tribes (who died out during overbearing colonial rule) and were mainstays for slavery in the 18th and 19th centuries. 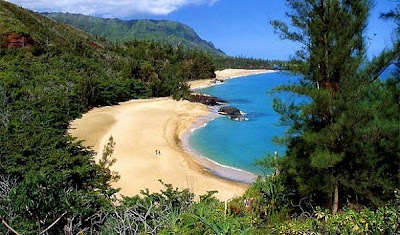 Now, thankfully, those who visit the islands are enslaved only by the sunshine and sandy beaches. Located in the Arctic Ocean, about midway between Norway and the North Pole, is the archipelago of Svalbard. There are a number of islands in the cluster but only three of them are inhabited, with the largest settlement in Longyearbyen, where the midnight sun lasts from mid April to the end of August. Located the Archipelago Sea – said to be the largest archipelago in the world, if defined by the number of islands – the islands of Finland are small, close together and change quite visibly during a lifetime, as glacial rebound in that part of the world happens relatively fast. Turku, on the southwest coast of Finland, was once the capital and is believed to the oldest city in the country. 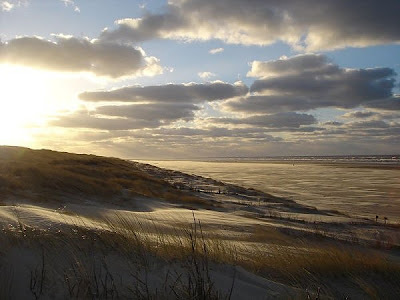 The Frisian archipelago spreads across the coast of three countries – Netherlands, Germany and Dernmark, but is owned by Germany. Most of the islands are protected areas, including the impressive sand dunes, and include an international wildlife nature reserve. 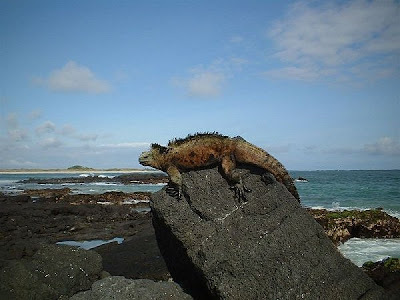 An iconic image of the Galapagos Islands, the iguana, basks in the suns rays atop a rock, trying to heat up before it ventures into the water again. Located on the Equator, off the coast of Ecuador, the Galapagos are home to a vast array of endemic wildlife making it a perfect place for Darwin to study natural selection and the origin of species, subjects which were to become both controversial and legendary. 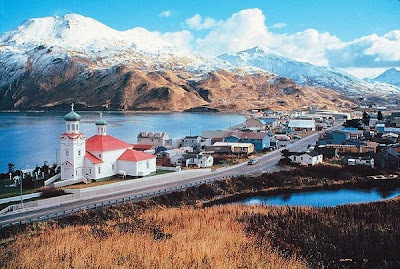 Unalaska belongs to the Aleutian Islands archipelago off the coast of Alaska and was first inhabited by the Aleut people, who numbered 1,000 in 1759. Russian fur traders soon moved into the area, much to the disgust of native Aluetians who tried but failed to drive them away. It soon became a leading trading port for the fur seal industry. Today the islands’ main catch is Bering Sea crab. 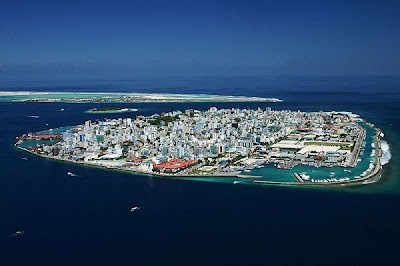 The Maldivian capital of Male offers a different view of one of the world’s luxurious archipelago destinations. Appearing to float on an atoll in the Indian Ocean, Male just about survived the tsunami of 2004, and there are fears that a number of its 26 atolls will be underwater in less than 20 years. Langkawi sits 30 km off mainland Malaysia in the Andaman Sea and consists of 99 islands, which until 1987 remained relatively undisturbed by visitors. 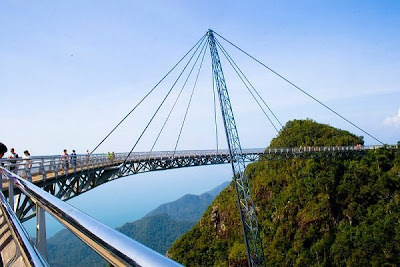 Now, Langkawi is a major holiday destination offering miles of sandy coastline and the scary looking Sky Bridge, which sits 700 meters above sea level. 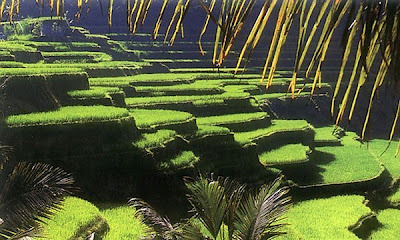 The rice terraces of Ubud in Bali are a familiar sight across much of the Malay Archipelago, the name given to around 20,000 islands between Southeast Asia and Australia, which include Indonesia, the Philippines, Singapore, Brunei, Malaysia, East Timor and the majority of Papua New Guinea. 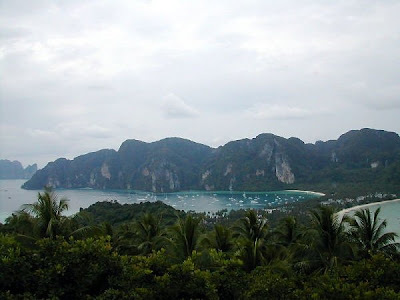 The Phi Phi islands are an archipelago of just six islands located off the coast of Thailand and are governed by the mainland province of Krabi. 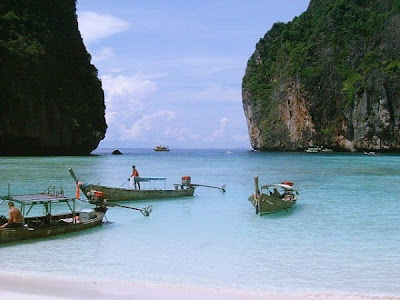 Ko Phi Phi Don is the main inhabited island and was immortalized in the Leonardo DiCaprio film, The Beach. Residents were none too pleased with 20th Century Fox’s behavior - they bulldozed the beach, clearing native coconut trees and sand dunes to make it look more like paradise. Law suits for damages meant they did not return to repair the damage, as was agreed. The islands were devastated by the 2004 tsunami to a certain degree, locals say it cleared all the landscaping done by Fox and it is slowly returning to its former glory. The Kerguelen Islands, also known as Desolation Island, is an archipelago in the Southern Indian Ocean and has a climate much like the Aleutian Islands of Alaska. 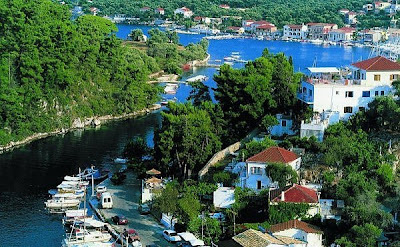 Popular with many a backpacker, the Greek islands are made up of a number of island groups and are otherwise known as the Aegean Islands. 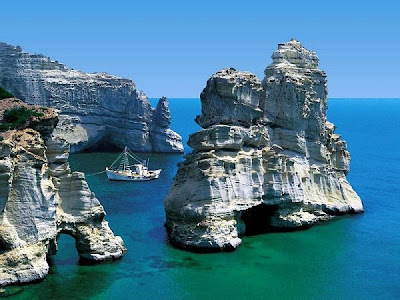 In fact the Aegean Sea was once called the Archipelago Sea. 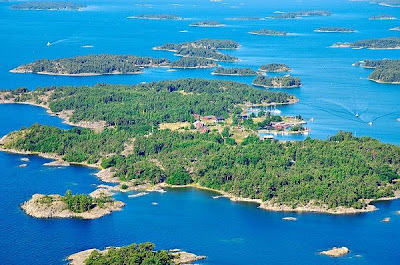 The term archipelago was soon used to refer to any island group or sea containing a cluster of scattered islands, like the original Archipelago Sea. The Balearic Islands are an autonomous archipelago off the east coast of Spain, in the Mediterranean Sea, and comprise of Mallorca, Ibiza, Menorca and Formentera. The highest peak, Puig Major, reaches 1,445 meters high and can be found on the largest island of Mallorca. All the islands are very popular with holiday-makers the year round, with Ibiza being Europe’s Mecca for clubbers.